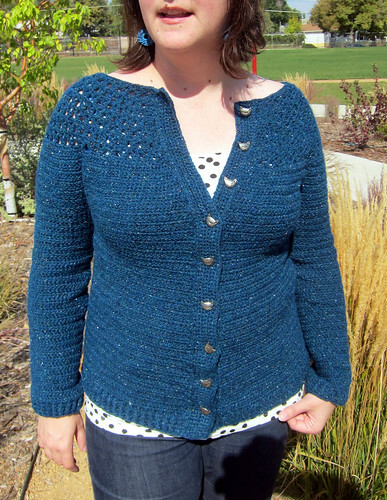 My contribution for fall is the Eyelet Yoke Cardi (here’s the Ravelry page), a simple to work top-down cardigan with a little bit of lace (err, eyelets) and a little bit of sparkle, thanks to the Berroco Flicker yarn we chose. The yarn is worsted weight but due to it’s chainette construction and the soft alpaca, it is light and airy–meaning it won’t weight the sweater down. Keep that in mind if substituting yarn– something on the lighter side (ie more yardage per grams) is going to make a nice drapey sweater. I went so far as to make my own, in the very same yarn, when I saw all of the new colors they released this year. 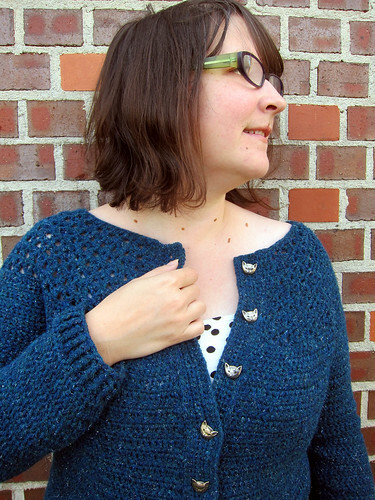 This deep blue is so pretty, and it’s a good value for the yardage. I made a size in between the Small and Medium (by doing fewer increases) and I think I used 10 skeins. I must say it is super warm, being 87 percent alpaca, so those eyelets act as nice little vents. Hah! But I am always hot, even when it is cold, except when I am not. I went all out and added these silver cat buttons from my stash to compliment the silvery glint to the flicker yarn. I like this yarn- it has glitter, but it’s not insane over-the-top shimmer. And it is really squishy. The pattern is $6.50, and it and the yarn are available online at Tangled. It comes in sizes: 32 (35.5, 41, 43.5, 48, 52)” bust circumference. You can also favorite on Ravelry! Since it’s top down, you can check the length and cut back on increases if you like to change up the size if you are in between sizes. Happy hooking!